"I've fallen in love with Ratanakiri, it is truly an amazing place. Yesterday I travelled with two French tourists I met on the bus up here from Kratie who are also staying at Treetops. We went out to two minority villages and also stopped at the gem mines and the pepper plantation. Riding on moto's out through the countryside is a remarkable way to see this part of Cambodia. The air is lovely and fresh, the people are lovely and the view is often spectacular when not surrounded by rubber tree plantations. The kids in the country also wave at you from the paddocks and from their doorsteps." Ratanakiri is a province in northeastern Cambodia that borders Laos to the north, Vietnam to the east, Mondulkiri Province to the south, and Stung Treng Province to the west. Ratanakiri is sparsely populated; only 150,000 people. They live in villages of 20 to 60 families. The word Ratanakiri is a derivative of two Cambodian words, combined to mean "place of gems and mountains". 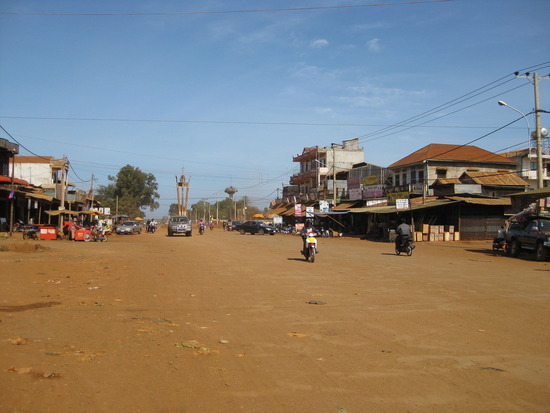 Banlung City is the provincial capital of Ratanakiri. Most visitors to Ratanakiri base themselves in Banlung City from where they make excursions/treks to Khmer Loeu villages and jungle areas, waterfalls, gem mines, and Ratanakiri's famous Yeak Laom volcanic lake. The city of Banlung is fairly small but offers some interesting shopping and a few decent hotels. The main market, Phsar Banlung, is a relatively unextraordinary traditional market offering the usual range of items for local consumption. There is one souvenir shop in front of the market, and food stalls set up in front of the market in the evening. For most travelers' needs (soft drinks, water, beer, liquor, toiletries, snacks, souvenirs, etc. ), the small drink shops next to the monument in the center of town carry most everything. Internet is slow and expensive but it is available and does work well enough for e-mail and limited surfing. 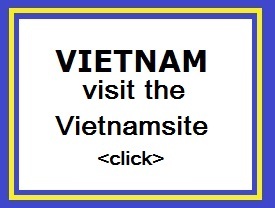 There is an Internet shop in the office with Royal Phnom Penh Airways opposite Phsar Banlung. There are not many restaurants in town and some of the best food is served at the hotel/guesthouse restaurants. After dark the town gets quiet fairly quickly. There are no banks or ATMs. Moneychangers are located on the road to the Phsar Banlung. Motorcycle taxi (motodup), rental motorcycle and bicycle are the primary ways of getting around town and the immediate area. Motodups run 500 - 1500 riel almost anywhere in town and $7-$10 for the whole day (limited to the area around Banlung.) Good English speakers that also act as guides may charge more. A motodup from the airport to town is about 1000 riel. The geography of Ratanakiri Province is diverse, encompassing rolling hills, mountains, plateaus, lowland watersheds, and crater lakes. Two major rivers, Tonle San and Tonle Srepok, flow from east to west across the province. The province is known for its lush forests; as of 1997, 70�80% of the province was forested, either with old-growth forest or with secondary forest regrown after shifting cultivation. In the far north of the province are mountains of the Annamite Range; the area is characterized by dense broadleaf evergreen forests, relatively poor soil, and abundant wildlife. In the highlands between Tonle San and Tonle Srepok, the home of the vast majority of Ratanakiri's population, a hilly basalt plateau provides fertile red soils. Rubber used to be a large industry, but these days it looks to be gem mining and tourism that form the lifeblood of the province. There is good quality zircon mined in several parts of the province and the prices are low compared to the west. However, in the long run, tourism is the future thanks to the abundant natural attractions the province has been blessed with Boeng Yeak Lom volcanic lake is outstanding, but in time the massive Virachay National Park may prove popular. A 2007 survey of Ratanakiri's Virachey National Park recorded 30 ant species, 19 katydid species, 37 fish species, 35 reptile species, 26 amphibian species, and 15 mammal species, including several species never before observed. 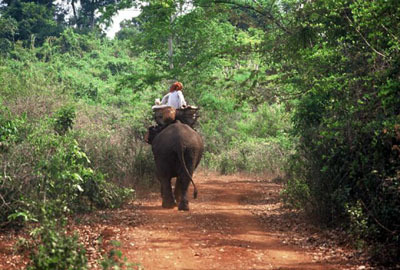 Wildlife in Ratanakiri includes Asian elephants, gaur, and monkeys. Ratanakiri is an important site for the conservation of endangered birds, including the giant ibis and the greater adjutant. The province's forests contain a wide variety of flora; one half-hectare forest inventory identified 189 species of trees and 320 species of ground flora and saplings. Nearly half of Ratanakiri has been set aside in protected areas, which include Lomphat Wildlife Sanctuary and Virachey National Park. 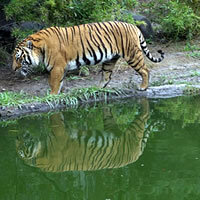 Even these protected areas, however, are subject to illegal logging, poaching, and mineral extraction. Ratanakiri tends to be cooler than elsewhere in Cambodia. The average daily high temperature in the province is 34.0 �C (93.2 �F), and the average daily low temperature is 22.1 �C (71.8 �F). Annual precipitation is approximately 2,200 millimetres (87 in). 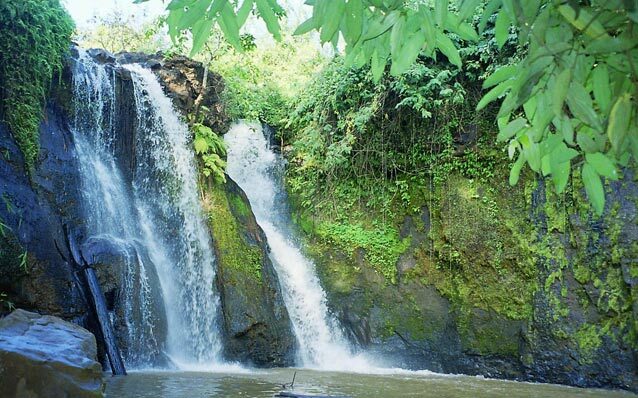 Flooding often occurs during the rainy season and has been exacerbated by the recently built Yali Falls Dam.